Dr. Warren’s blogger articles on parent advice. What is Brain Training or Brain Fitness and is it Helpful? I am a learning specialist and educational therapist. However, I tell many of my clientele that I’m a personal trainer for the brain. I help individuals of all ages to improve overall cognition, develop compensatory learning strategies and master optimal study skills. I have seen, first hand the power of brain training. Brain Training, Brain Fitness, or Cognitive Remediation is the act of strengthening deficits in learning or weak areas of cognition. This is typically done using activities that concentrate on specific areas of difficulty. Just like a personal trainer or physical therapist can focus exercises on a particular part of the body, many learning specialists, educational therapists and learning coaches can help individuals of all ages to improve memory, visual processing, auditory processing, attention, executive functioning, stamina and more. The brain is not inflexible and fixed. Instead, it continues to grow, if exercised, throughout our lifetime. Repeated brain training creates new neuro-pathways, clears the hurdles that trip the thought processes and helps the mind run smoothly and efficiently. In addition, early intervention can sometimes cure or remediate learning disabilities, assist the head injured in regaining skills and can even prevent diseases of the elderly such as Alzheimer’s and dementia. The bottom line is that it is never too late. How Should Brain Training Activities be Administered? When instruction focuses on the area of difficulty, it’s important for the activities to be engaging and fun. They need to start at a simplistic level that offers some challenge for the individual, and difficulty is increased as the participants experience success, thus keeping them in their zone of proximal development. Where Can I Get Brain Training Materials? I have been creating cognitive remedial tools for the past nine years. To learn more about my products go to Good Sensory Learning. Otherwise, one of my favorite home-fun options is Lumosity. https://godyslexia.com/wp-content/uploads/2016/01/Go-Dyslexia-2-1-300x300.jpg 0 0 Erica Warren https://godyslexia.com/wp-content/uploads/2016/01/Go-Dyslexia-2-1-300x300.jpg Erica Warren2015-11-12 00:24:002016-01-02 21:04:48What is Brain Training or Brain Fitness and is it Helpful? Did you know that comfort foods such as ice cream, chips, cereal, and cookies can impact children’s health, behaviors and ability to learn? As a child, I learned that I was allergic to preservatives, and once I got off of processed foods, I felt tremendous cognitive gains. There is a multitude of reported, dietary remedies for students with learning disabilities and ADHD, however, what works for one individual often does not work for another. The reason for this is that each individual has their own background, genetic makeup, and sensitivities. As a result, finding a natural remedy can be a bit of a process, but I believe that it is best to address the cause then to treat the symptoms with medications. Do Allergens/Intolerances Impact the Brain? Everyone’s body reacts differently to food allergens and intolerances. Some common indicators are hives, sneezing, coughing, a swollen tongue or lips, and a stomach ache. However, because allergens travel in the bloodstream, they also affect the brain. Allergies to food can upset hormone levels and alter key brain chemicals. In addition, allergies can cause fatigue, a slower thought process, irritability, hyperactivity, impaired concentration and in extreme cases aggressive behavior, depression, anxiety, learning disabilities, and schizophrenia. Dr. Joseph Egger from the Pediatric Univeristy in Munich and his team studied the effect of food on 76 hyperactive children to find out if diet contributes to behavioral disorders. Results showed that 79% of the participants had adverse reactions to artificial food color and preservatives. In addition, 48 different foods produced symptoms in the children. For example, 64% reacted to milk, 59% to chocolate, 49% to wheat and 16% to sugar. What’s more, once the participants eliminated the triggers, behavioral problems diminished, and they reported additional benefits such as fewer headaches, fits, stomach aches, rashes, achy limbs, and ulcers of the mouth. Preservatives/Nitrates: Preservatives are now known to cause a number of problems such as neurological and reproductive problems, headaches, difficulty breathing, and anaphylactic shock. There are many names for these offenders. Here are a few: sodium benzoate, sodium nitrite, sulfites, nitrate benzoic acid, propyl gallate, BHA, BHT, and TBHQ2. Artificial Colors and Flavors: Hyperactivity, behavioral disorders, attentional problems as well as learning disabilities have been linked to artificial colors and food flavors. To learn more, CLICK HERE. Excitotoxins: An excitotoxin is a chemical often found in soups, dressings, broths, canned vegetables processed meats and snack foods. It causes brain cells to become excited and fire uncontrollably leading to the death of the cell. MSG and other excitotoxins such as aspartame (Nutrasweet) are used to enhance food flavor and trick the brain to eat more. There are many other names for excitotoxins and some include sodium caseinate, calcium caseinate, anything “hydrolyzed,” autolyzed yeast, and yeast extract. Other common culprits are carrageenan, citric acid, soy protein, “seasons,” and natural flavors. Cane Sugar: Cane sugar and other sweeteners such as corn syrup, cane juice, dextrin, dextrose, maltodextrin, molasses, rice syrup, and sucrose can cause difficulties for some individuals. A study at the University of South Carolina found a correlation between increased sugar intake and destructive and restless behavior in hyperactive children. In addition, a study at Yale University concluded that diets high in sugar may increase inattention in some kids with ADHD. Other food allergies and intolerances. Some common sources of food allergies and intolerances are: wheat, milk, eggs, beef, corn, and chocolate. What Can Be Done to Uncover Allergies or Intolerances? Get Tested for Food Allergies and Intolerances: One simple solution is to go to your doctor and ask for a comprehensive allergy test. These aren’t 100% reliable, so I would also consider the other options listed below. Keep a Food Diary: A food diary or log can be a time consuming, but reliable method to finding the best solution. A child’s diet can be documented and symptoms or noteworthy behaviors can be recorded. In addition, a child’s pulse can be taken and recorded after each meal, as an increased pulse rate is an indicator of an allergy or intolerance. Once a particular food is thought to be a possible allergen or intolerance, this food can be eliminated from the child’s diet and the results can be recorded. Consider follow a diet such as the Feingold diet. Please keep in mind that other environmental factors from pollen to perfumes can also wreak havoc on the brain. So be sure to be cautious when selecting bottled cleaners, glues, air fresheners, detergents, pesticides and other commonly known irritants. Furthermore, some additions to one’s diet can also help. Known beneficial supplements include omego-3 fatty acids, iron, zinc, vitamin D, and magnesium. Deficiencies in all of these have been shown to worsen attentional difficulties. Finally, mindful meditation and exercise are two more powerful agents that help to combat the symptoms of learning disabilities and attentional problems. Many parents, teachers and administrators worry about whether academic accommodations offer an unfair advantage to some students. They are concerned that providing services such as extended time on tests, the use of a computer with a spell check, a reader or a copy of the teacher’s notes provides an uneven playing field. If all students came to the classroom with the same brains and experiences, offering them equivalent expectations and an identical curriculum would make sense. However, that is not even close to the truth. In fact, each student offers diverse strengths and weaknesses, developmental levels, experiences and abilities. As a result, fair shouldn’t be about all students getting the same things. Fair is that each student gets what he or she needs to learn. So How Can a Student Get an Accommodation if This is What They Need to Learn? The Americans with Disabilities Act of 1990 (ADA) and Section 504 of the Rehabilitation Act of 1973 both use the term “reasonable accommodation” to represent the modifications or adaptations resulting in equal access or improved accessibility to buildings, programs, and academics. They provide changes to traditional methods so that students’ disabilities do not impede the learning process. For example, if a student has deficits in fine motor control and their penmanship is labored and illegible, a reasonable accommodation may provide a copy of the teacher’s notes. Consequently, this student’s disability will not get in the way of learning lecture-based content. Many Schools are Now Offering Informal Accommodations. Is this a Good Option? Schools often offer this option to families, as it can save districts a lot of money on testing, meetings and staffings. The problem with informal accommodations is that the teachers are not mandated to offer services and they can be discontinued at any time. In addition, informal accommodations never apply to standardized tests such as the SATs. If, however, a student is receiving formal accommodations, they are protected and modifications or adaptations result in equal access or improved accessibility to buildings, programs, and academics. Who can Initiate Reasonable Accommodations? Any student with a qualified disability or their legal guardian/parent can request a meeting that can result in reasonable accommodations. Please note that the disability must be documented by the school or an outside source and the results must be presented at the meeting. If there are no prior testing results, you can request that the school provide the needed testing. Contact your local school district to learn about their step-by-step procedure. Make sure to put all requests in writing and also indicate that you wish to tape record the meeting. This blog post is intended to provide an overview of reasonable accommodations and is not legal advice. https://godyslexia.com/wp-content/uploads/2016/01/Go-Dyslexia-2-1-300x300.jpg 0 0 Erica Warren https://godyslexia.com/wp-content/uploads/2016/01/Go-Dyslexia-2-1-300x300.jpg Erica Warren2015-09-30 22:29:002016-01-02 21:08:19Are Academic Accommodations Fair? I love to use stairs and tiled floors when teaching math concepts. In fact, I integrate as much movement and games as possible into my lessons with students. This week, I will present my rationale and share a specific kinesthetic and playful strategy for teaching the coordinate plane. Although many educators recognize the connection between learning, movement and games, many dismiss the correlation once children get beyond first and second grade. I propose we are never to old to move and play! It feeds the brain by increasing blood flow and oxygen. It improves attention, alertness and motivation by uniting the brain and body. It helps nerve cells to bind together, which is the basis for learning new information. It triggers the development of new nerve cells from stem cells in the hippocampus which is an area of the brain that is used for memory and learning. Studies also suggest that when students engage in academic games, they become more excited about school and their learning increases. In fact, by uniting movement and games with the curriculum students can encode new content on a body or cellular level. Body memory suggests that the body is capable of storing memories in organs, whereas cellular memory suggests that memories are stored in the cells of our bodies. 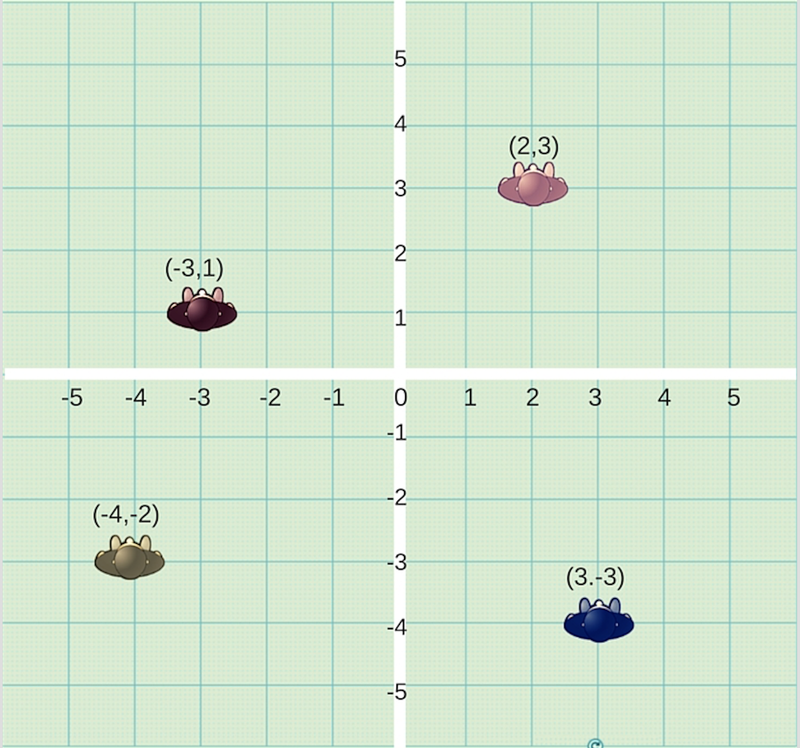 Here is an easy, kinesthetic game that can be used to help students master the coordinate plane. Ask two student volunteers to use masking tape to designate the X and Y axis of the coordinate plane on a tiled floor. Next, ask two or more students to write the numbers on the X and Y axis. Finally, challenge another to define the four quadrants. Break the class into two groups (Group 1 and Group 2). Hand each group 16 index cards (you can play with more or less cards – depending on the number of students in the class). Ask the group members to write out four points for each quadrant such as (-3, 5). Check the stack of cards for accuracy and then ask a student to shuffle and swap the cards with the other group. Ask Group One to begin the game. One at a time, each member of the group will select a card from the deck and stand on the designated point on the coordinate plane. If there are not enough students to stand in the coordinate plane, then the index cards can be placed on the designated points. Group One will discontinue play when they have at least two players (index cards) in each of the four quadrants. Ask Group One to add up the number of points they plotted on the coordinate plane. Clear the coordinate plane for Group 2. Ask Group Two to repeat the same process. The winner of the game is the group that plotted the fewest number of points on the coordinate plane. Clearly, teachers who require students to remain seated during the entire class period are not promoting optimal learning conditions. By adding movement and games, students will maintain engagement and energy levels and provide oxygen-rich blood to their brains for highest learning performance. There are many successful adults with learning disabilities, but what are the common traits that these people share? A 20-year research study by the Frostig Center in Pasadena, California answered this question and they identified 6 key attributes that contribute to success. Self-Awareness: Understanding one’s strengths and weaknesses is an important indicator of success because students can learn to utilize their strong abilities and, with the right support, deficits can be remediated. One of the best ways to define difficulties and talents is by pursuing a comprehensive neuropsychological evaluation and then working with a learning specialist or educational therapist on remedial methods and compensatory learning strategies. Proactivity: Learning that we can control our future and that we can affect the outcome of our lives is another earmark of future success. Individuals that are proactive make and act upon decisions, assume responsibility for their actions, and are willing to consult with others and weigh options. Perseverance: Pursuing goals with repeated persistence despite difficulties is also a common characteristic of successful individuals with learning disabilities. These individuals are resilient, motivated by challenge and continue to refine their approach until they reach their objective. Goal Setting: Setting attainable yet flexible goals is another key trait for success. These goals cut across education, employment, family, and personal development and often includes a well-organized and planned approach. Support Systems: Supporting, guiding, and encouraging family members, friends, mentors, teachers, therapists, and co-workers are also important indicators of success for individuals with learning disabilities. Yet, as these individuals move into adulthood, they often reduce their dependence on others and usually switch roles to help others in need. Clearly, one of the best things we can do for students with learning disabilities is to provide the nurturing support system and mindful discussions that will help them to develop these key attributes that lead to success. Every student processes information and learns differently because we each have our own, individual cognitive makeup as well as strengths and weaknesses. As a result, the key to successful remedial outcomes is to celebrate, understand, and accommodate the unique ways that each student thinks. How Can Educational Therapists and Learning Specialists Uncover How Each Student Thinks? There are a number of things that professionals can do to reveal how each individual processes information. Read comprehensive psycho-educational evaluations and progress reports. Talk to parents, teachers and other professionals that know this student well. What Valuable Information Can Be Gained From Prior Testing and Reports? A comprehensive psycho-educational evaluation can help uncover each student’s strengths as well as their areas of challenge. On the one hand, by focusing on strengths, professionals can help students to develop compensatory learning strategies, so that they can learn to work around difficulties by using their best abilities. For instance, a student may struggle with writing due to spelling and graphomotor challenges. However, if this student also possesses excellent expressive language skills, they could use speech recognition software to sidestep their difficulties. On the other hand, by remediating areas of challenge, students can often improve cognition and develop abilities. For example, by repeatedly exercising an area of cognition, a student’s capacity can improve over time. How Can Discussions with Parents, Teachers, and other Professionals Help? Discussions with parents, teachers, and other support personnel can also help to uncover areas of talent and challenge. What’s more, feedback can provide clues concerning strategies that have and have not worked in the past. The most important individual to consult is the student. Surprisingly, they are often overlooked. In fact, many students, when asked the right questions, can guide you to quick and easy interventions. One of the most important activities is asking the student how they think and approach different learning tasks. Do you hear an inner voice? Do you make personal connections to the information that you are learning? Question them more about their capacity to visualize? Can you imagine imagery in your mind’s eye? How strong are your visualizations? Are your mental pictures in color or black and white? Can you hear, taste and smell your visualizations? Do you use mental imagery while learning in school? Ask them more about their internal voice. Can you hear thoughts and ideas in your head? Can you hear your memories? Do you ever rehearse information aloud when trying to learn or memorize it? Pat struggled with school-related anxiety and expressive language deficits. He experienced great difficulty communicating verbally and through written language. When I asked him to try and explain to me what it was like inside his brain to write, I offered him the choice of using words or a drawing to share his thoughts. I was surprised that he had no difficulty finding the words. Pat expressed that it was like trying to do a puzzle. His problem was that he could only look at one piece at a time. He had no access to the gestalt or big picture. This was such an insightful comment that helped me guide his instruction to learning the “formula” to writing, so that when he “picked up a single piece of the puzzle” he would know where to place it. Peter was diagnosed with dyslexia and ADHD, and he had the most trouble with written language. When he came to me, everyone reported that he struggled with “writer’s block.” When I asked him how his brain worked when trying to write, he could not come up with any words to describe his internal process. However, when I gave him a dry erase board and some markers. He quickly produced an insightful image. Many squiggly, overlapping lines were trying to get through one small opening. Peter didn’t have writers block, he had, what I like to call, “writer’s bottleneck.” Instead of having no ideas, he had too many ideas, and we found that creating his own graphic organizers was the solution. Sue struggled with memory deficits and her problems manifested in poor test grades. Through discussion, I soon learned that Sue had what I call, “a blind mind’s eye.” She was unable to create mental imagery, and her visual memory was extremely poor. Through discussion, Sue remembered having a wonderful imagination as a young child and recalled using mental imagery when playing. Soon, she realized that her ability to visualize stopped after she experienced the traumatic experience of seeing her father die of a heart attack. This event was so disturbing for Sue, that, as a coping strategy, she mentally blocked her capacity to visualize. Once she realized this, she was able to make the conscious effort to tap into this ability again and her visual memory and capacity to visualize improved, resulting in higher test grades. Communicate with teachers and other professionals. Educate the student and help them to learn metacognitive skills, a growth mindset and self-advocacy skills. I hope you found this blog helpful. I would love to hear your thoughts. not, you can usually find used copies on the internet. p Mark school events on the family calendar. p Schedule and attend parent-teacher conferences. p Create a study schedule for each student in the house. p Arrange childcare, tutors and after-school activities. p Establish a firm bedtime before school starts. p Determine where and when your child will do their homework. p Figure out a plan for balancing homework and free time. options like fresh eggs, yogurt with fruit, and gluten free organic bread. likes and make snack bags. I love to get all my snack food from Tierra Farm. individual needs of your child. as their needed accommodations for the teachers. TimeManagement and Organization for Success. 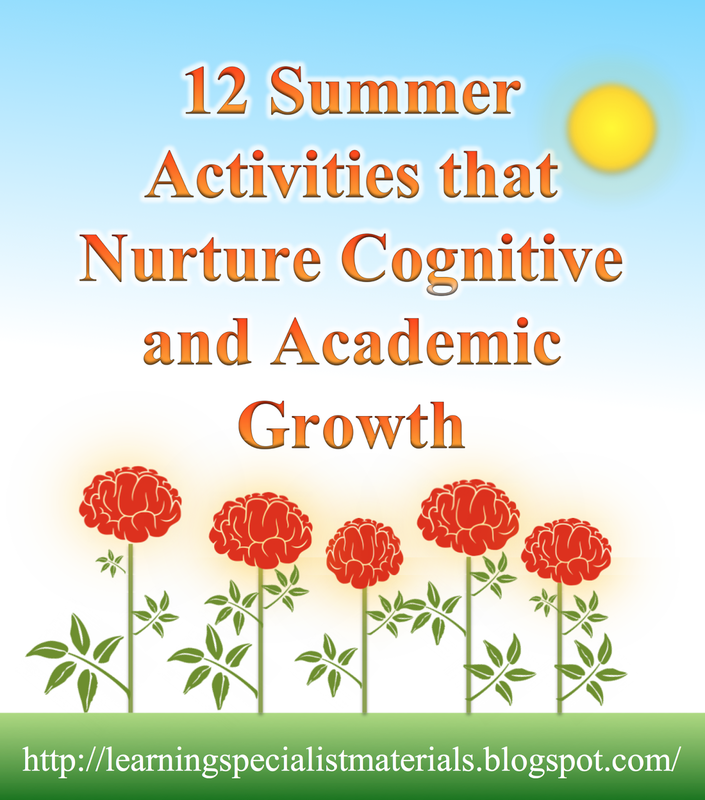 Over the summer, many students experience the “summer slide” phenomenon and lose both cognitive and academic gains from the prior school year. In fact, those who are already behind, can be the ones that stand to lose the most. However, this doesn’t have to be the case! With as little as an hour a day, students can maintain and even improve their knowledge and abilities. So what can we do to help our young learners fight the slide and make significant gains while having fun? Design a fun learning nook with your house for your children, and have fun coming up with an imaginative name for this magical space such as Penelope’s Princess Palace, Bobby’s Boisterous Bungalow, Hal’s Happy Hideout, Amy’s Adventure-filled Attic, Ian’s Imaginative Igloo… This can be created in a loft, in a tent, under an elevated bed or table etc. Use pillows, drapes, Christmas lights, stuffed animals, and pack it with fun books, activities and other learning resources. CLICK HERE for some fun resources. Find fun apps and websites that kids can play on Ipads and computers. CLICK HERE for a list of online resources. CLICK HERE for a list of app resources. Designate a specific time each day where the whole family gets together to have a “love, learn, and laugh hour.” You can work together on a project, play an educational game or work individually on your own project. Go to educational places like the science museum, the planetarium, aquarium, nature center, etc. Arrange an “adventure” or “exploration” and take pictures or collect objects from nature. Afterwards, have fun looking up the names of each the items and learning about them. Create learning stations such as “Magical Mathematics, Whoopee Words, Spectacular Science, Brain Busters…” Fill each station with activities and resources. CLICK HERE for some fun resources. If math is difficult, work together to create a math manual. Create a fun and enticing title for the project and use images, define the sequence of steps required to complete a problem, integrate memory strategies, and most of all use lots of color and art supplies. This can also be done for reading, fine motor weaknesses or other areas of difficulty. Sign students up for fun programs like The Khan Academy, the Nessy line of products. Write a family summertime newsletter or blog that can be shared with friends and family. Let your children be a part of taking images, videos, writing articles and more. You can do this for free on Blogger, or sites like Edublogs and Kidblog that offers teachers and students free blog space and appropriate security. Teach your children about giving back to the community by picking up litter, volunteering with an animal rescue organization, visiting the sick or elderly, feeding the homeless, or pull weeds at a community garden. Integrate learning into everyday activities. For example, you can teach about measurements when baking together, or allow your child to help you balance your bank account. Even a boring chore, such as food shopping, can be fun when kids are in charge of cutting coupons, making grocery lists and collecting the needed items. If you can think of other fun ideas, resources or links, feel free to share them by commenting on this blog post.